“Just to remind you I have a case (magnums) of the 2004 Ch. Leoville Barton. Twelve days later as it happened. Mr. SipSwoosh and I get together with David and Catherine several times a year. On each occasion, whether it’s at our house in London or theirs in Cambridge, wine takes centre stage. Sure, we eat brilliantly. We’re all good cooks. But in reality, the wine is the thing. And, with only a fledgling cellar, I reckon I’m getting the better end of the deal at the moment. David has a collection of wines dating back to the 80s. Mostly French, much of it left-bank Bordeaux, Sauternes and Barsac. Some is inherited. Some given. Some bought. Luckily, he wants to share these wines with friends. On this occasion, I brought the aperitif and plumped for Prosecco. The good stuff, mind. You have to do a bit of research (see this post on Italian Wine Blog Vinissima for a quick guide) and be prepared to pay upwards of £15. 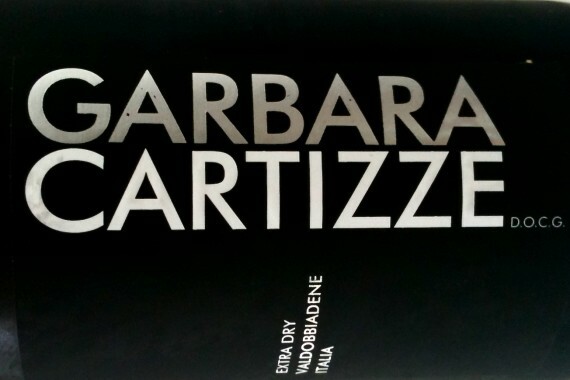 I tracked down a boutique single-vineyard Garbara Cartizze at Philglas & Swiggot. Despite saying “extra dry” on the bottle, this tasted of fragrant white peaches – almost Bellini-like. It was floral too but with a refreshing steeliness lingering in the background and a hint of citrus peel on the finish. Fuller in body than your usual Prosecco, it had persistent, fine bubbles too. Classy. “Ideal aperitif wine, ” declared David. 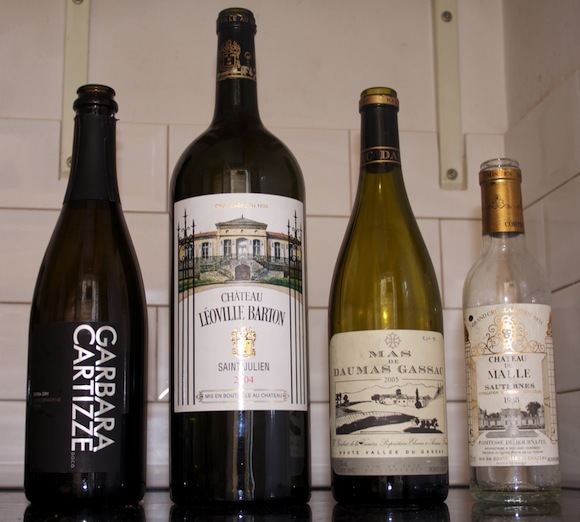 He then opened the Leoville Barton and a 2005 Mas de Daumas Gassac Rouge, a Cabernet-based wine that the Berry Bros. & Rudd website describes as “the Lafite of Languedoc.” despite being a Vin de Pays. The Leoville Barton tasted more advanced than the one I’d drunk a few weeks before, probably because the storage conditions were different. The intense blackcurrant flavours had softened and fragrant black plums dominated along with cedar and graphite (David thought it had a 4B lead pencil taste, Mr. SipSwoosh a 6B). Silky and structured with integrated tannins and good acidity, I thought this was bang-on ready to drink. Super. The Mas de Daumas Gassac Rouge was dull in comparison. On the nose, some brambles, earth and a whiff of cow dung (probably Brett). It tasted of dark fruits, gravel, green stalks. But this particular bottle lacked the intensity we were anticipating, and seemed flat even though it was only six years old. Ch. de Malle is one of the top Sauternes producers in Bordeaux (classed a second growth). David’s concern was that this bottle hadn’t been stored properly for part of its life. But it danced out of the bottle, singing with flavours of oranges, blossom, acacia honey, straw and hazelnuts. Quite light in body compared with other Sauternes I’ve drunk, it was a fab match with fresh passion fruit. We were all sad we only had a half-bottle. It was a great night with a chance to drink some iconic wines, and further improve my wine knowledge.